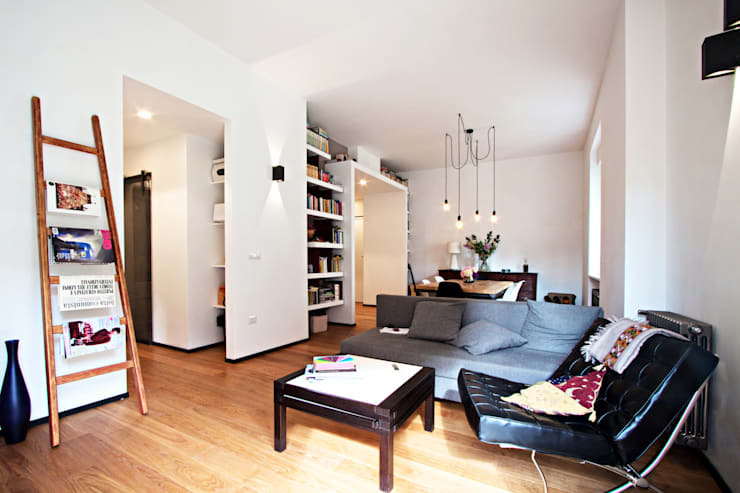 If you're looking for ways to make a standard-sized modern apartment (with good natural light) look fabulous with great dividing walls and interior architecture, then you’ll love this home. The standout feature here is the built-in bookcase. While most built-in bookcases are designed to sit flush with the walls, this one is recessed from the doorway and some of the shelves are almost floating. The shelves are also quite thick and give the bookcase a chunky look. It’s interesting to see that they can be accessed from both sides of the wall. This definitely gives the bookcase some depth and makes the room appear big. Finally note how wide this doorway is. That also makes the room feel spacious. The home has a big, bohemian-style aesthetic. This is largely due to the great variety in the furnishings. We have a simple grey sofa, stylish Italian seat and an improvised ladder for storage. Despite the rather eclectic appearance of the living room, there is a definite theme going on here. It’s modern and slightly industrial. One of the most important ways to make an interior design feel professional is by giving the room a sense of scale and contrast. 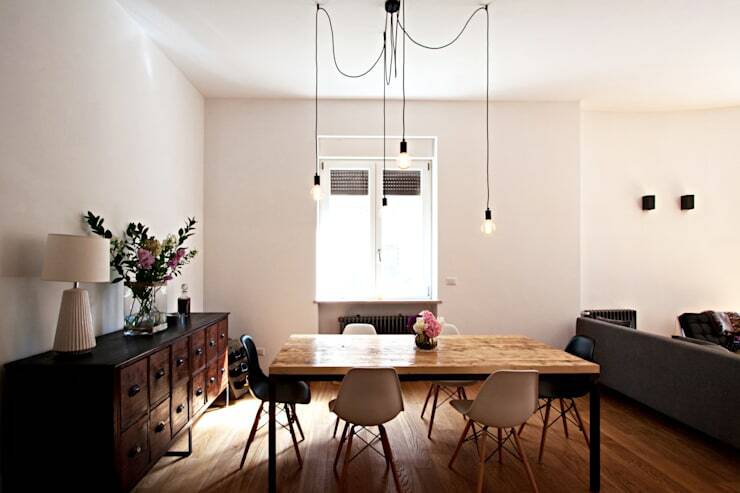 This is done by using a variety of furnishings at different heights. Here we have quite a simple wooden table and a lovely antique sideboard – both set fairly low to the ground. In contrast we have some fine, antique-style pendant lights draping down from the ceiling at varying heights. There are few elements on display here, but there is definitely nothing lacking or empty about the design. 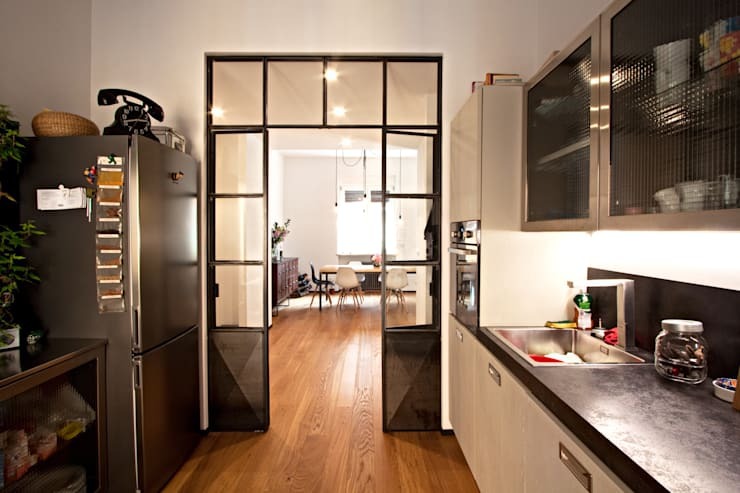 The kitchen has an attractive industrial-style dividing wall with small panes and a black frame. 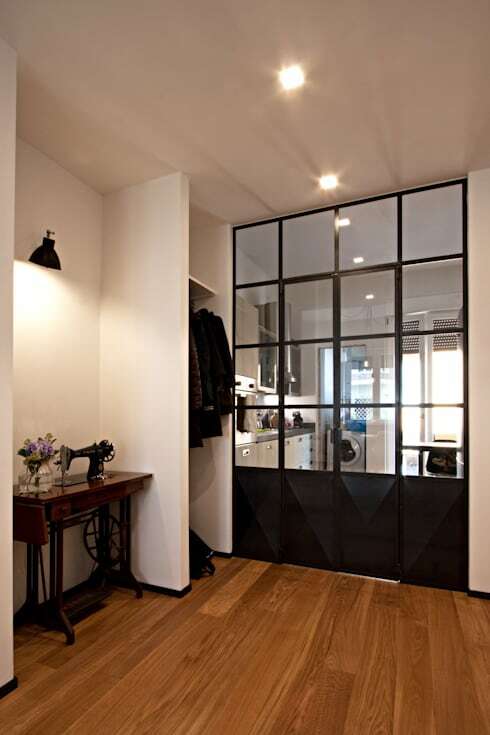 The sharp contrast between the black frame and the white walls really draws your attention to the height of the home. It also gives this hallway a strong focal point in the design. Also, note antique sewing machine on the left. Small elements like this add much character to the home. Finally, we should mention the small open hallway closet. Again, it makes the most of that height in the room. Any industrial kitchen definitely needs some stainless steel elements on display. Here we have that with the large refrigerator and wall cupboards on the right. The kitchen is largely monochrome, and this gives the rather disparate combination of lines and elements a sense of cohesion. The slightly haphazard variety also adds that special family-style warmth to the modern home. As promised, this is a home that may help inspire you to try out some bold lines in your home interior. Here in the little bathroom, we have a big white ceramic basin that’s a real eye catcher. The curvy aesthetic is enhanced even more by the addition of a round mirror. Note how abundant this bathroom feels despite the small size. 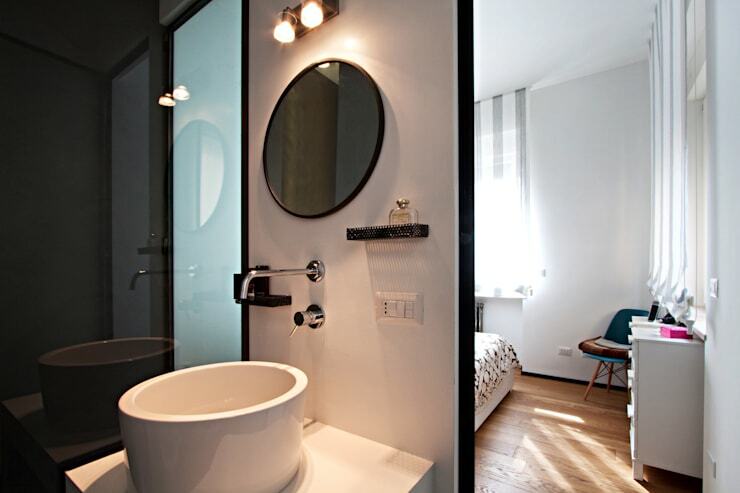 It’s a home that shows you can make a bathroom feel luxurious no matter how small the floor size. For something a little closer to home, have a look at: A bright modern apartment perfect for Singapore. 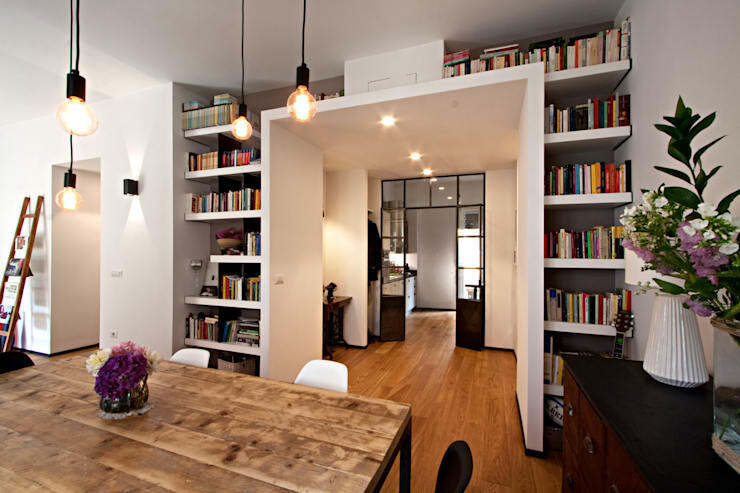 What do you think of the bookcase in this home?